Purchase Bonnie Latham Art Prints online from ArtBarbarians.com located in Minnesota. You really don't have a complete collection of stunning art until you own Bonnie Latham art prints from your friends at Art Barbarians. Why not do something different that will give people a sense of a fine art with well-known Minnesota wildlife artists? We humbly suggest that you make an investment wildlife prints which will give you beauty and an increasing value over time. Many of today's best wildlife artists come from the heart of America, where the land and wildlife influences people deeply. There's nothing quite like a natural scene to evoke a sense of serenity and restore a calming effect to your life. When we exhibit Bonnie Latham art prints, we aren't so much about selling a painting as we are helping you bring some of the beauty of our native land into your interior spaces. 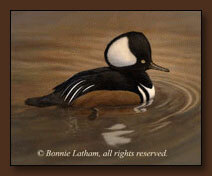 Imagine a Merganser duck in it's natural habitat or the majestic look of an owl resting peacefully. You don't have to imagine it as we have prints from many famous Minnesota artists, the best in their genre, bringing this into your life. You'll like working with us as we are as passionate about this art form as you are. Think about areas that you may want to exhibit great wildlife pictures of the Midwest, a game room, living room or maybe a dining room where it will draw the special attention of your guests. There are so many ways to incorporate these fine art pieces into your home. Bonnie Latham began her art career at a very young age. Inspired by her family and their love of the outdoors, she paints nature, landscape, animals, birds, and the occasional portrait. She works in watercolor, oil, inks, graphite/charcoal and others, however acrylics & watercolors have become her mediums of choice. Bonnie won the Federal Junior Duck Stamp competition for 2000-2001 and has been honored in Washington, DC both in June, 2000 for the first day of sale and stamp signing ceremony and the awards presentation in November, 2000. Bonnie has entered the Minnesota Junior Duck Stamp Competition 5 times, winning a second place and 2 first places as well as the Best of Show. You may want to browse our wildlife prints and you'll find that our selection of Bonnie Latham art prints is one of the deepest on the Internet, with many other artists listed here as well. We're adding new paintings and prints everyday, after that you may want to move onto our original paintings area which will give you an idea of the depth of the art we carry. It's exciting to be a part of an offering which brings people such a sense of satisfaction and joy. The colors, the depth, the natural settings, all of this makes this art we care about so special. We have a picture here featured called "Barn Owl II". It's a picture of a owl in a natural posing and you really get the feel of the feathers and fluff of this wonderful creature. The colors of the bird are outstanding as if you were there seeing it in the wild. But these artists aren't just about a realistic effect, the prints and paintings have a feeling which draws you in and brings out something deeper within ourselves. If you've ever lived in the north country, you know wonderful it is to see these great birds in the wild, but rarely do you see them. Call us if you have any questions about anything you see on our web site. We're happy to answer your questions personally regarding availability or something special you're looking for.